Imparting Grace: Caring for Myself Body and Soul 9:Not saving things "for good"
Not saving things "for good"
Many of the lessons I learned as a little girl I try to remember. Others, I need to forget. One I'm trying to forget is the idea of saving things "for good." My family wasn't rich, but we had a few nice things. Those nice things weren't for everyday life, though. We always had to take off our good clothes so they wouldn't get dirty and remove our good shoes so they wouldn't get scuffed. We weren't supposed to walk on the good rug, and we almost never used the good china. We used the word good a lot, I remember. The good stuff was there to be admired, but not to be enjoyed. Is that the way it was in your house? I learned very well the lesson of saving things for good. Because of that, I have good perfume that's dried up in the bottle. I have good sweaters that have been eaten by moths. I have good scarves that have languished in the drawer. I own those good things, but they haven't done me any good. So I'm done with that. I'm not saving things for good any more. Here's a little example. You see the china cabinet in the photo above? That cabinet was full of pretty objects that never got used. Frankly, getting things out of their special places in the cabinet was more trouble than it was worth. So there they sat, only for show. Then one day I decided to take the hutch off the cabinet. Of course, that meant I would be sacrificing display space. Turns out that losing display space was the right move. 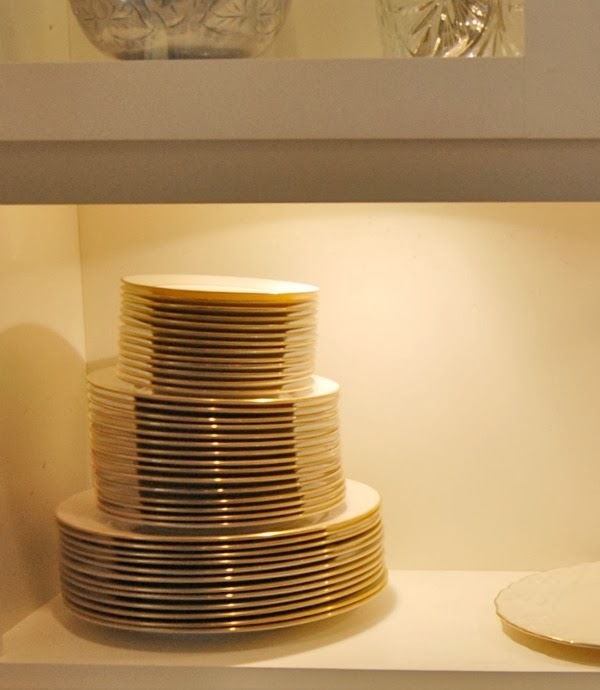 Now the dishes form a sort of china-leaning-tower-of-Pisa, but it's so easy to grab them. And the crystal glasses? They stand in orderly rows, soldiers ready to be called into service. Of course it's risky, this business of using things that I once saved for good. Breakables can get broken. Valuables can get lost or stolen. But the richness and pleasure that using these lovely things brings to my life is worth the risk. Instead of saving things "for good," I'm actually using them for good. All in all, that's a good trade, don't you think? This post is the ninth entry in a 31-day series: Caring for Myself Body and Soul. Yes. My mom saved her china for good. Which means we never, ever used it. So, she has a perfect and unused set. I determined I would not do the same thing. I have my dishes, someone else's dishes, and my granny's china and I use them all. I use my cloth tablecloth and I use my stemware. 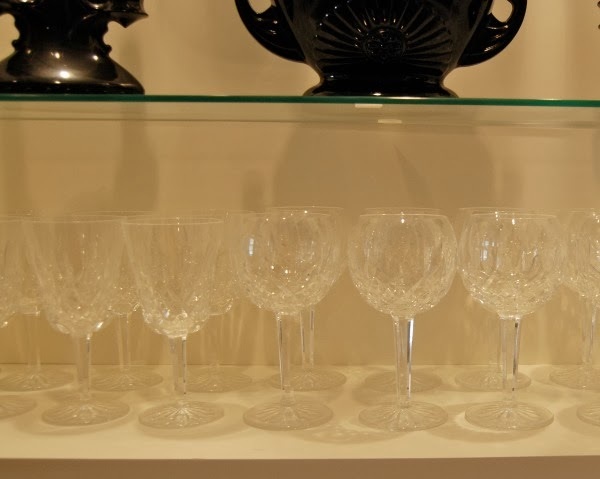 And yes, especially some of the stemware has gotten broken, but I have memories from using them. I hear ya sister! :) It just makes sense to enjoy what you have and let others be comfortable using them too! Have a great day Richella! And I use my grandmother's china every day. This is very good post ! I remembered those days when my Mom feed us with broken/chips plate. Yet her nice plate just sitting in cabinet just for show. Now, my husband and I use our good China that we got from our wedding gift almost everyday. As result we broke one already( accident happened ). But they just things that could be replace. I love this post! It's a great lesson to all of us that every day is special and we should cherish each and every second we have. 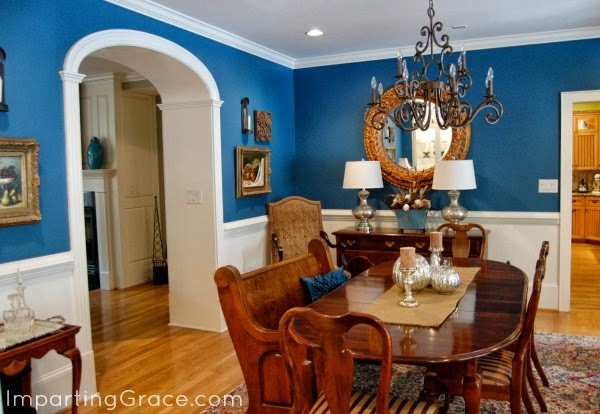 Oh, and your dining room looks beautiful without the hutch!! Hello, I also feel that life is to short to save all our treasures! It feels good to use the things that make me feel special! I agree Richella. I want to use what I have or give it to someone who will. Thanks for this thought provoking series. Oh, I love your post and it's made me think, as I do use everything, in fact I'm making a party just to use my new transferware in Blue and White. I love to use everything in my house. My mother did too and still does. Thanks for the advice, it made me think! I have my mother in laws beautiful gold and white china that no one ever saw used and her daughters didn't even remember that she owned! I love it and I use it. 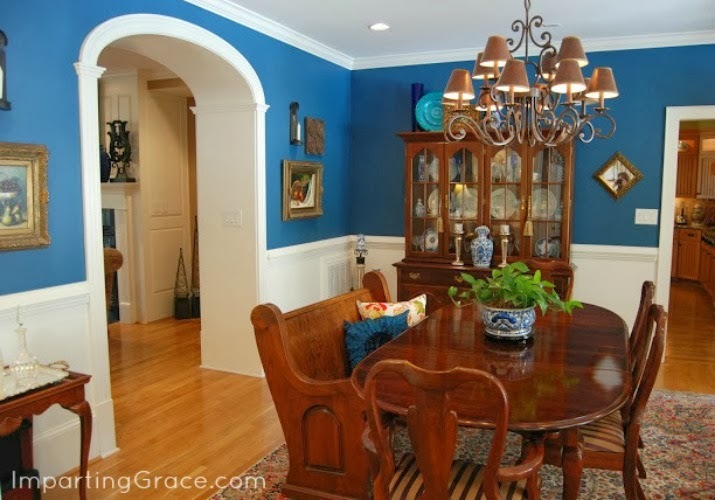 Taking the hutch off the china closet was a brilliant move -- not only is the china more accessible but you have room for those GORGEOUS mirror and lamps! I so agree with what you have written, and I make it a point to drink a little water or wine out of an antique brilliant period cut glass piece to enjoy it, or sip my tea out of my wedding china. It's amazing how those small things can make one's soul feel so appreciative. This series is a great idea. I will look forward to reading more posts. It actually was the one thing I didn't like about our big, beautiful farmhouse, the home my husband grew up in. It was perfect for raising our three boys, seven acres, a pond and almost 4,000 square feet of living space but I wanted one or two big rooms instead of "formal dining rooms", "formal living rooms", etc. It was the way of the 60's and 70's! I agree! We use vintage china every day, and I have 3 boys, ages 4 weeks, 4 years and 7 years old. ;-) Once in a while something does break, but not very often. And the boys are learning how to take care of nice things. I absolutely agree, although, I probably don't use those special things as often as I should. Just the other night, though, I pulled out my MIL's silver flatware and used it with some Walmart pumpkin bowls and plates. It made my hubby smile -- enough said!